I was recently fooling around with NETR Online, a site where you can see old aerial photos on its “Historic Aerials” section. 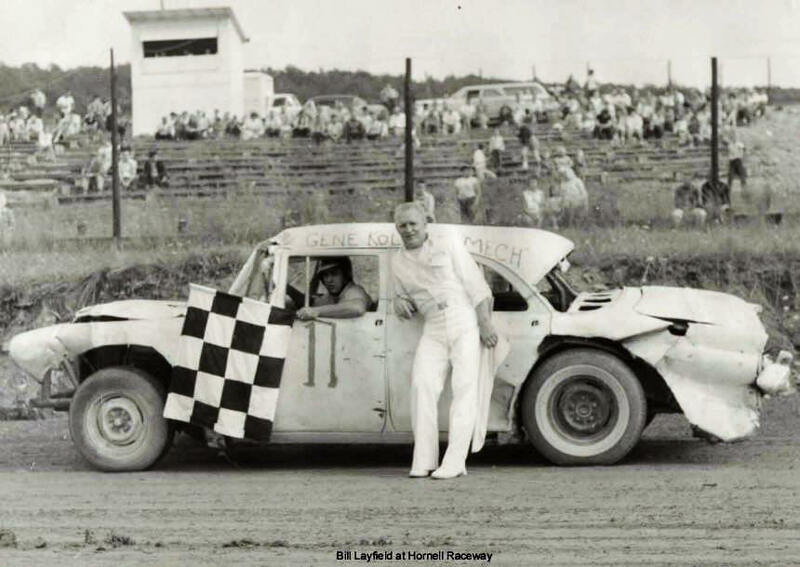 I struggled for quite a while to locate the long – lost race track location of the Hornell Raceway, near the New York community of the same name. I don't know why it was so unwilling to be found, but I did finally track it down. 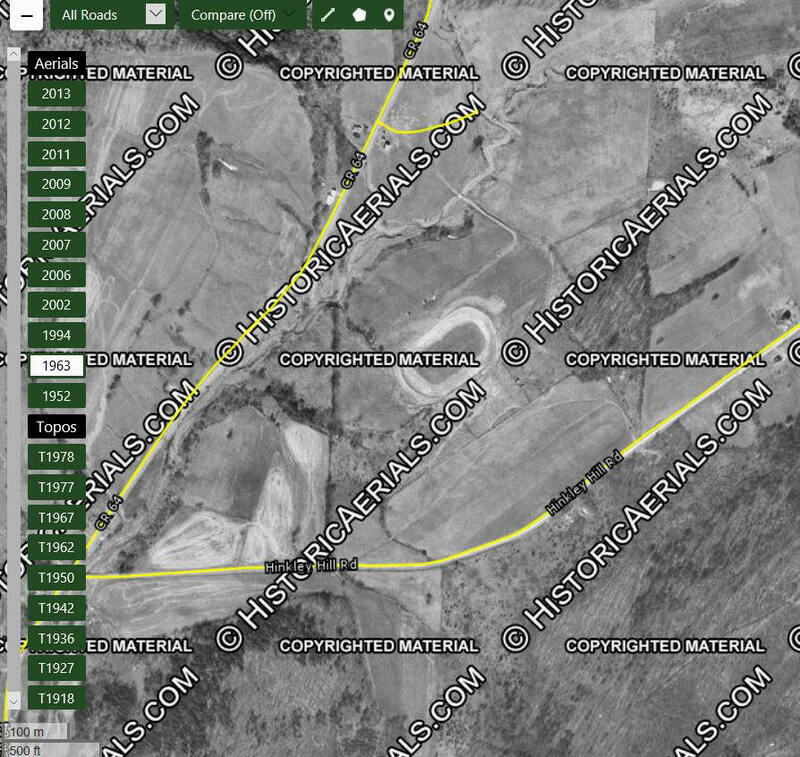 The discovery of the site, plus related historical work by local historians of that region got me to thinking what a neat little track the raceway was, and how it was and apparently still is treasured by folks near there. One writeup says that a local man, inspired by the 1959 opening of the Daytona superspeedway, decided to use a large parcel of land he owned on Ashbaugh Hill outside of town to construct a race track. found where the heck it was in this 1963 aerial photo. 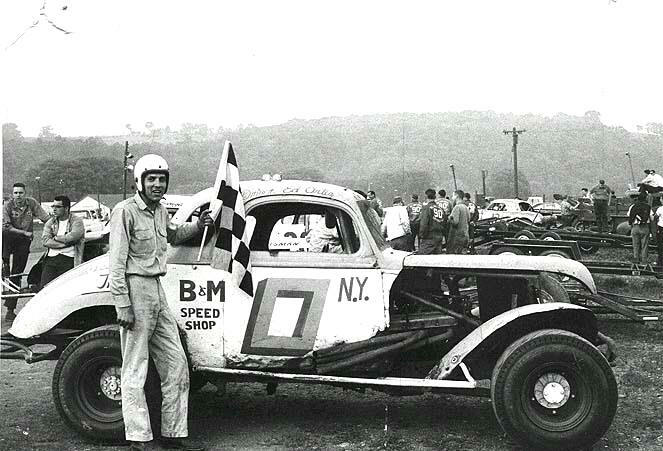 brother of the more famous Dean Layfield with the flagger, former driver Whitey Gorsuch at Hornell. Heck, the little state of Vermont, in 1951, had 22 tracks operating simultaneously. And, keep in mind, many more tracks had come before and would afterward that decade. 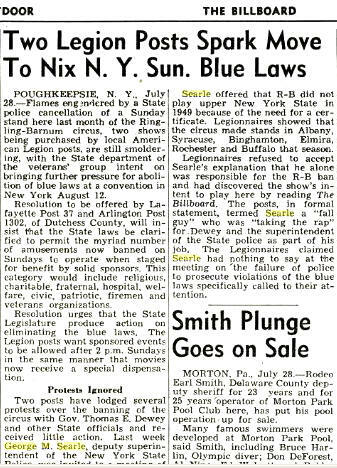 Both states survived the early 50's attempt by law enforcement and district attorneys to stop the sport by using archaic Sunday Blue Laws that forbade sports of that type on the sabbath. None of these people, save few churtchgoers who could hear racing above their parson's sermon, gave a damn about the sabbath. It was just an excuse to give racing a hard time. [A lot like now]. Poughkeepsie fighting the ridiculous Blue Laws. Tracks all over New York and Vermont fought them and found ways around them. 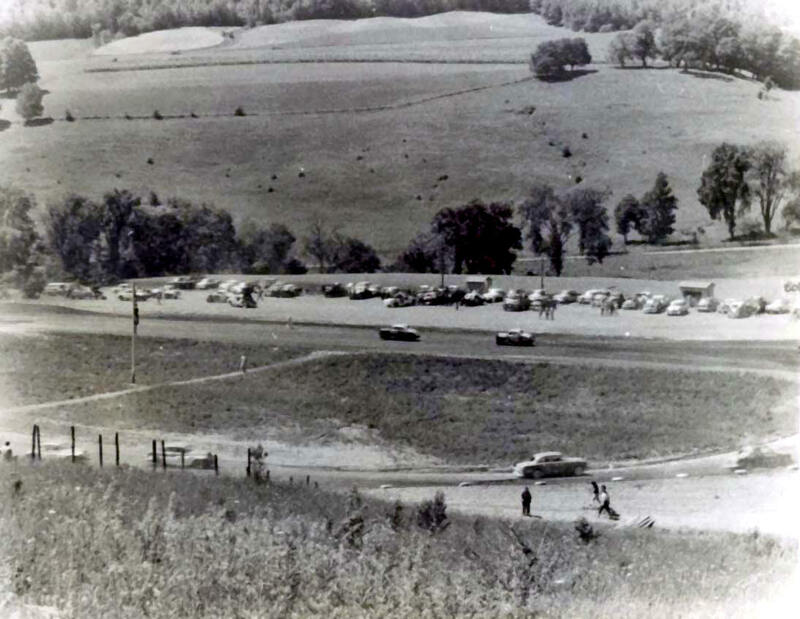 Just like tracks all over New York state, Hornell Raceway had many neighboring race facilities of various degrees of sophistication and safety [most erring on the low side of both]. 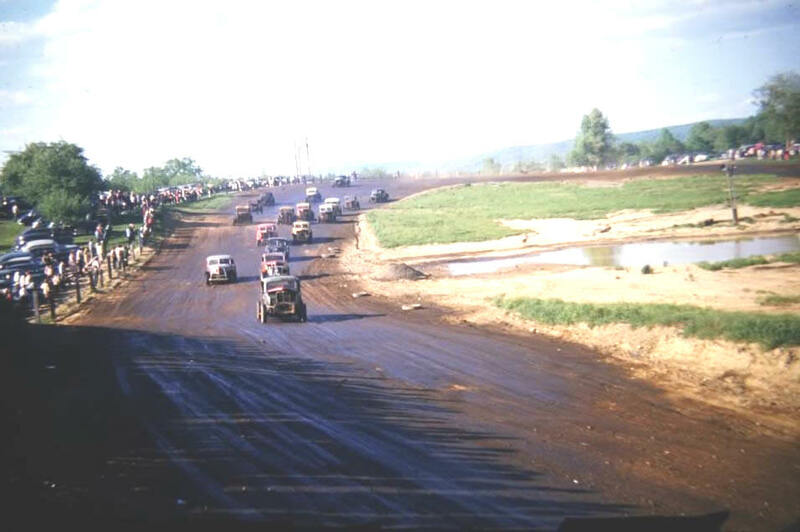 Just in the immediate region of Hornell, alone, there was a track in Bath, NY, a famed Watkins Glen road course, a track in Naples, a track in Wellsville, a track in Angelica, the Cuba Lake track in North Cuba, a Drum Raceway, a track in Olean, the Hunt Raceway, Circle K, in Whitesville, and Sportsman Raceway in nearby Pennsylvania. That doesn't in to account tracks within a reasonable distance like Waterloo and more. 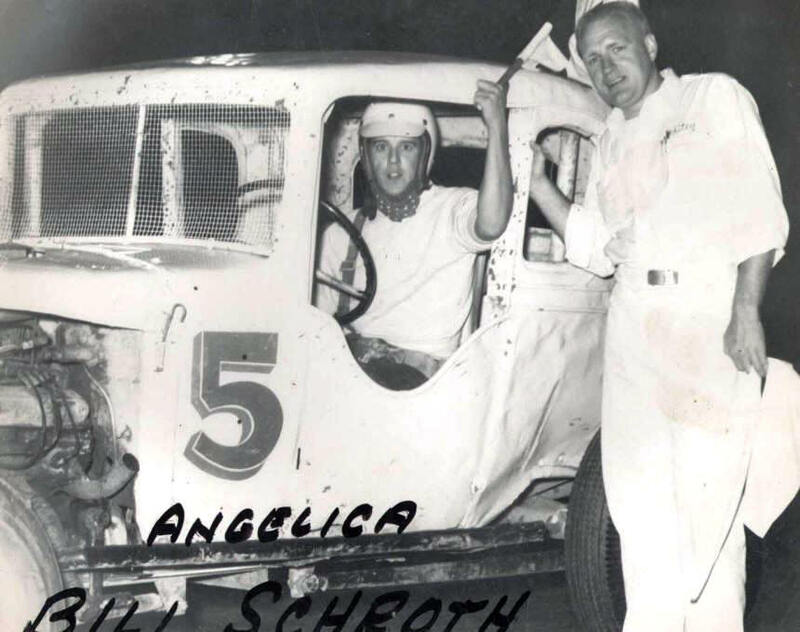 gets the checkers from Whitey Gorsuch at Angelica Speedway. Several of these tracks benefited from close proximity to larger population centers such as Buffalo and Syracuse. An article about the first race ever at Wellsville mentions that winner Johnny Sloper of Medina was already a veteran of racing at Buffalo's Civic Stadium, where he would have competed against some of the best thatWestern New York and some of Canada had to offer then. The location of these tracks did not benefit from the lake effect climate they were forced to endure. Articles mention program cancellations due to rain and “Canadian smog” in several instances. at the nearby Olean Speedway. 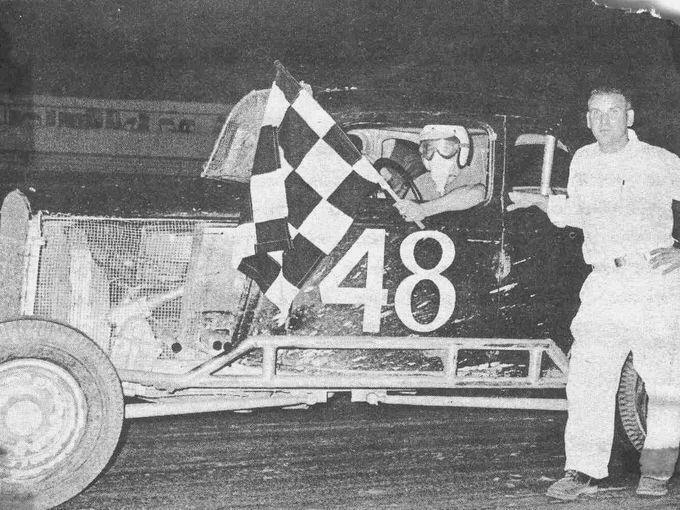 One of the earliest stars, Andover's “Flying Dutchman”, Whitey Gorsuch went on to become the flagger at a number of these tracks including Hornell [which started much later than of the others in 1959]. One of the biggest names in this early racing there was Lucky Cornish; others were Dean Layfield and “Curley” Hatfield. The Wellsville track, looking ahead to the anticipated ban on racing, considered moving its program to a week night. The numerous articles about the track never mentioned if it did this, which would have necessitated erecting lights. 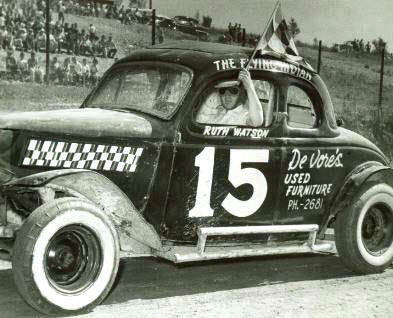 It did , however, join with NASCAR around 1951. Racing programs at most of these tracks usually featured an adequate, but not huge field of cars, time trialing [in the earlier days], and eager crowds who came and stayed, whether the tracks was one of those environmental disaster oiled affairs or whether it was a dusty mess. And, they often came dressed in their Sunday best. 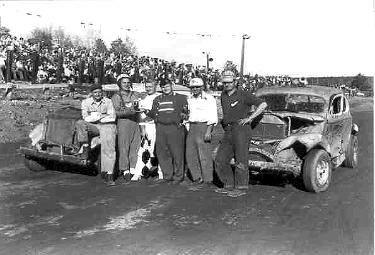 Stock car racing, the sport of the common man, was brand new, very exciting, and usually involved some of their neighbors. As this photo from Quebec's Bouvrette Speedway shows, people often dressed to go the races in the 1950s. Not to be discounted was the danger factor, as safety features in the early jalopies and stock cars were virtually nonexistent. Most of the photos from the Naple, NY track show a huge fire that engulfed a number of cars. 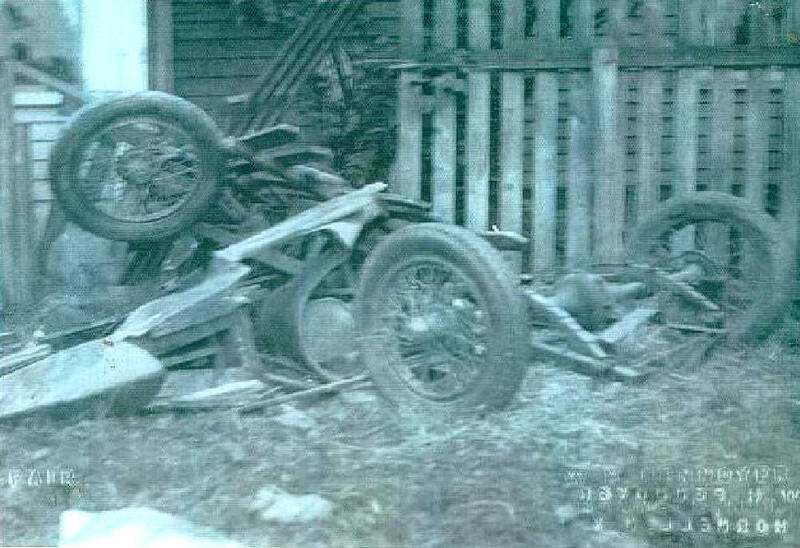 Drivers were regularly ejected from rolling cars because there was no technology nor uniform rules for restraints. Heck, the spectators were often not much less in peril, often standing beside a track devoid of catch fences. Racing in this area produced some stars would race on, into the 1970's, in some cases. 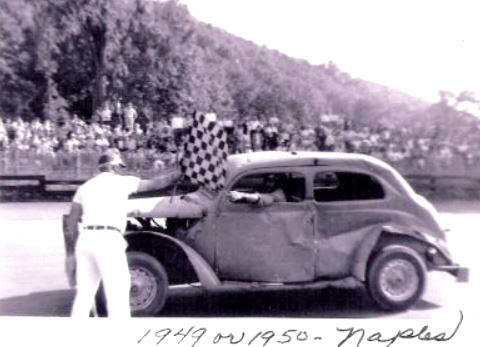 Lockport's Ken Meahl, who began driving dangerous roadsters at the Seneca Falls track in the late 1940's, would graduate to crude, but safer stock car coupes. 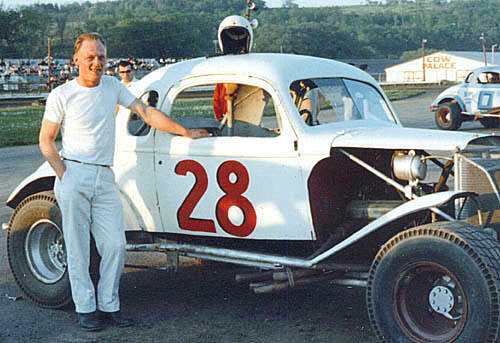 He would further his career doing some good driving for a young Jerry Cook before the future NASCAR National Modified Champion was old enough to driver; and he would go on to the fast Snediker 28's out of Rochester. over thirty feet in the air at Fonda. Little did he know in this picture beforehand. The Olean track saw drivers like Bill Schroth and Doc Hoctor, whose son carried on the racing tradition in the 1980's. Jack Soper and his #7 were top performers all over western New York for years. 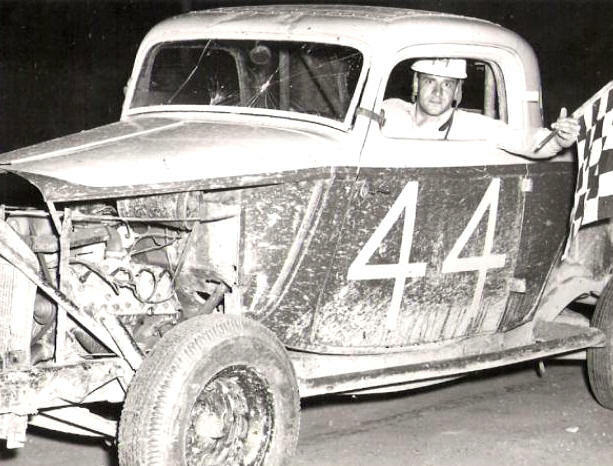 The legend, Dutch Hoag came from Bath, NY and first performed at the local tracks before becoming a nationally – known star and a winner of some the Langhorne race of champions events. Much like tracks in my area, race facilities in this region sprang up like dandelions in May all over New York [and everywhere else in the Northeast]. And, just as quickly, a great many of them were gone by mid decade. 1959 was a very pivotal year in stock car racing. The aforementioned Hornell Raceway came into being, supposedly influenced by big construction in Daytona. But, also, many tracks all over the northeast closed that same year. may arguably have been just as big as Hoag – at least in this territory. Even by the 1960's, racing had settled down a bit, with most of the remaining tracks being much more safe and running faster, safer cars than before. 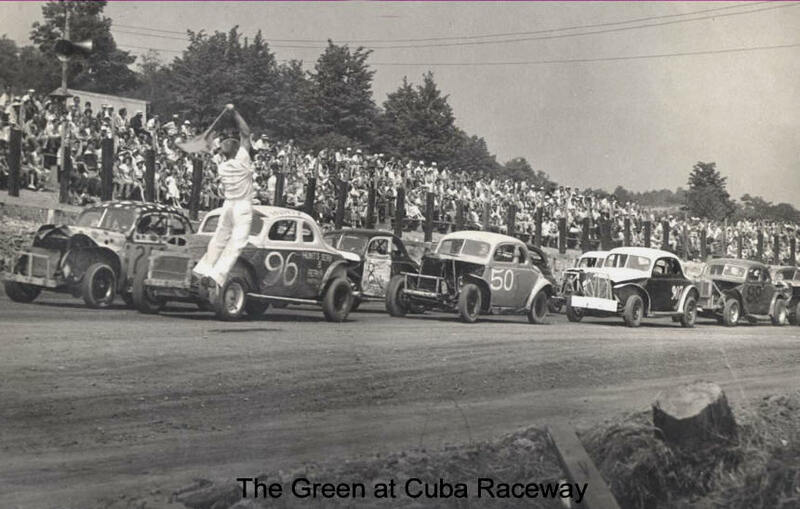 Stock car racing – particularly in New York – was becoming a more expensive, more sophisticated sport and some of the leading cars from western New York featured power plants far more potent than even those in the more prominent Central and Captial District areas of the state. 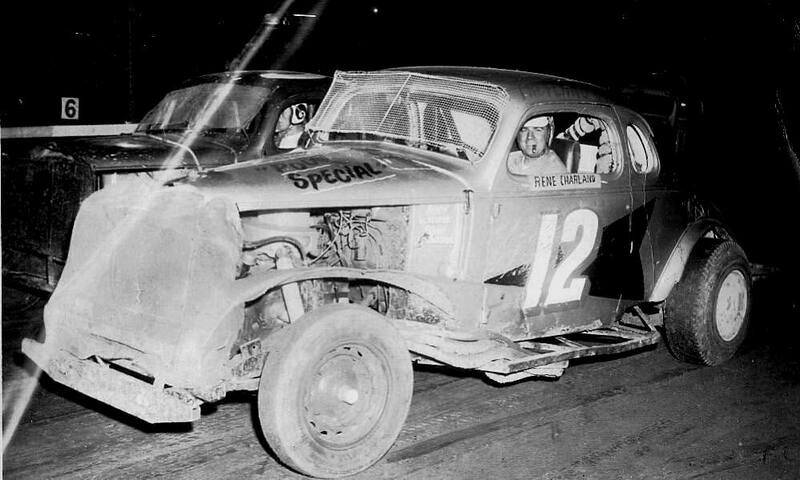 Fonda Speedway was very much a showcase for NASCAR sportsman racing then, but often invaders like Ed Ortiz would come in with thundering B&M engines and outpower the regulars. But what was being lost in that upgrade was the child – like glee that came from attending those earlier “jalopy” races at a track near you. Drivers could be clearly seen, as cars had little protection inside and even the most safety – conscious pilots had no closed faced helmets – just Cromwell helmets with leather straps and maybe some goggles or a bandana. For those not quite sure why so many early drivers wee photographed with a cigar in their mouth – the semi-soft cigar, clenched in their teeth, kept their teeth from crashing together on horribly bumpy tracks. Leave it to the 1950's to offer cigars as a piece of safety equipment. Ed Ortiz's car bears the B&M Speed Shop reference. Bruce Fleischman and Milt Johnson built some beastly motors. Below - Perhaps saving his teeth was originally why Rene Charland came to always have a cigar. He never seemed to smoke them. It seemed like dozens of men hanging around the pits sported those silly military – looking hats they used to make many blue collar guys wear – like gas stations or even trash disposal trucks. Remember when most gas station attendants actually washed your windshield while wearing those stupid hatss and the uniforms with bowties ? Others, like many track officials, wore those safari – looking helmets to protect them from the sun at races that were usually in the afternoon. People would strain forward to try and get a snapshot of a favorite car or driver through their Kodak Brownie box cameras. 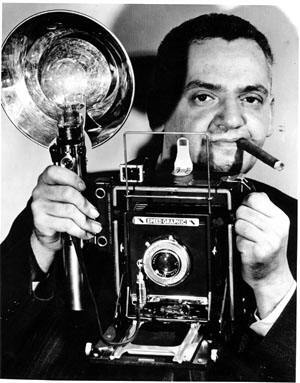 The few real photographers had to carry those heavy “Speed Graphic” newspaper cameras, going through a fortune in disposable flash bulbs. 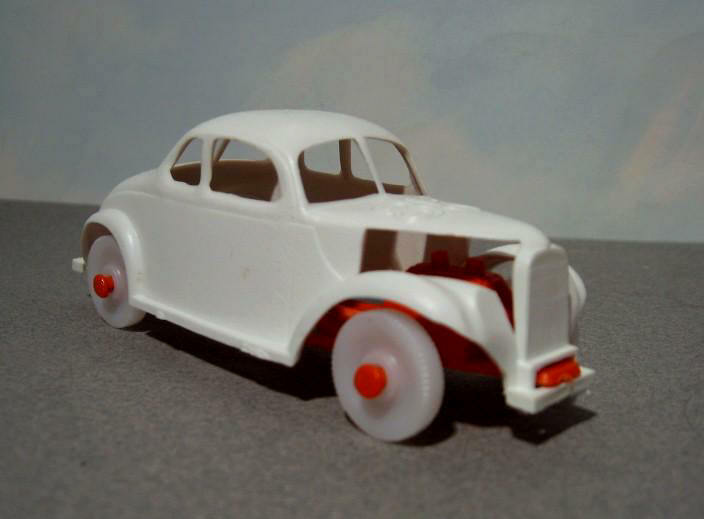 Much like you see today, most little kids wanted to run around waving a cheap little checkered flag from the concession stand, and the lucky ones got a plastic stock car toy that almost always looked like a '37 ford coupe. of that time. 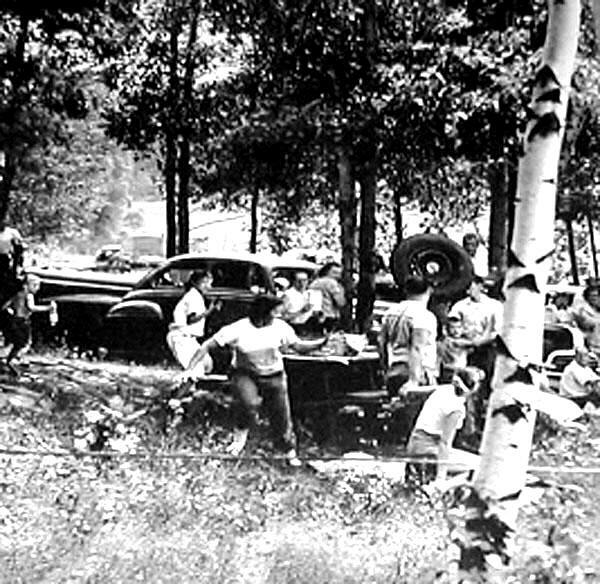 Below – A track official walks by one of Steve Danish's cars at Mettawee Speedway, Granville, NY. Bring on the elephant hunters ! Track were not yet known for being good with particular foods, like today. You were lucky to find a concession stand with perhaps lukewarm soda and some hot dogs of not too dissimilar temperature. This was regarded as a big treat, given the excitement of watching “hot rods” scream around a bumpy, dusty track and maybe crash. One of the nation's top weekly magazines [perhaps LIFE] once featured a chance photo of people attending a race at the early Burden Lake track near Troy, NY and having to dodge a wheel flying through where they were having a picnic. I bet few of them were deterred by this near death experience; it was something to tell the girls about at the next canasta game. 1950's newspaper photographers got to struggle with with those giant Speed Graphics cameras. Below – Daddy, can I have one of those little stock cars ? Huh ? Huh ? This coming season  the venerable Airborne Park Speedway [on its umpteenth different promotion team] will try to rise from the ashes by putting a dirt surface down on its graduated banking asphalt track. This definitely increases its chances of survival, which were close to nil before that. I wish them well. They will spend more on just preparing for the first week than several of those old tracks near Hornell did for an entire season together; and there's no guarantee of success. As ACT's godfather, Tom Curley said, the sports is no longer new; kids are harder to impress and more likely to be attracted to video game racing and X Games cars; the sport no longer has characters; and you can't see what the drivers look like on track any more; even the crashing seems under control now and the sport is so expensive everyone is irate if many crashes occur. Lastly, most of the cars look just like every other car in that division. In the 1950's you didn't need decals to tell what kind of car it was supposed to be. with a dirt late model from more recent decades. Kinda hard to tell what those were sometimes.